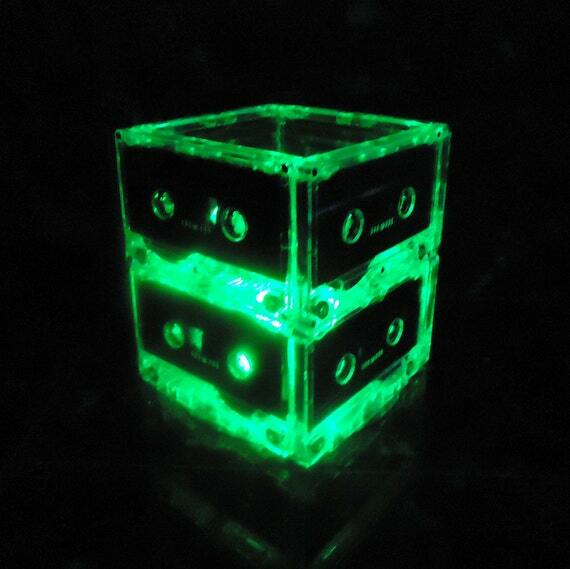 This rockin' retro Cassette Tape Night Light Mood Light Lamp is so unique and fun and sets the mood just right for a party or a relaxing evening in. 8 repurposed very rare blank cassette tapes and one CD handcrafted into a super fun rockin' retro centerpiece light holding 10 battery operated GREEN mini LED lights. The 8 very rare cassette tapes have nothing printed on them, so it has a very sleek clean look. Most people do not realize the lamp is made from cassette tapes until they look closer or you tell them. The colors are beautiful and just enough light to be a nightlight or mood light in your bedroom or living area. You will "LOVE" it and so will your guests!